Vancouver is famous for its mix of mountain, rain forest, ocean shore and urban life. This landscape is carved from a bedrock collage of different rock types, each with a unique geological history and landscape form. Cartoon cross-section of the Earth below the Vancouver area showing the major rock types and the nature of their contacts. 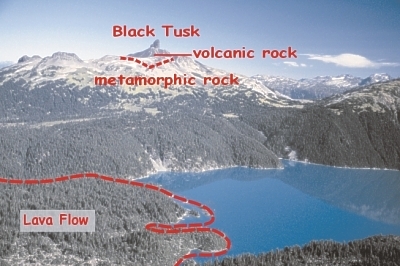 Geologists distinguish five major rock types in the Vancouver area. The most extensive are: (1) granitic and (2) metamorphic rocks of the Coast and Cascade Mountains. Overlying these within the Fraser Valley is a thick sequence of (3) sedimentary rock (sandstone and shale). 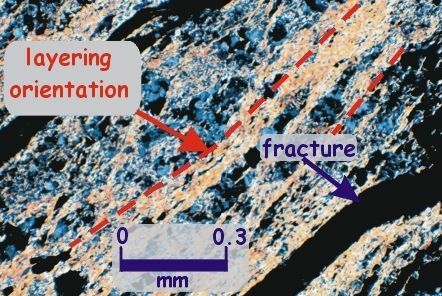 Volcanic intrusions (4) fill fractures within granitic, metamorphic and sedimentary rocks. Younger volcanic rocks (5) make up volcanoes built on older granitic and metamorphic rocks. Each rock type is an aggregate of minerals. The different colour, texture, hardness, porosity and chemistry of each rock type reflects the different type, shape and size of their mineral constituents. Rocks are forming today in a great tectonic 'kitchen' below southwestern BC. Fueled by heat from the earth's interior and collision between continental North America and the undersliding oceanic plate, this kitchen produces a variety of rock types along with earthquakes and rising mountains. 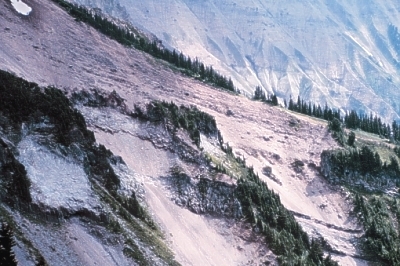 Sediment eroded from mountains accumulates in basins such as the Strait of Georgia and converts with deep burial to sedimentary rocks. Forces of tectonic collision deform deep crustal rocks into new metamorphic rocks. Melted rocks cool to form bodies of igneous granitic rocks. Where these rock melts rise to the surface, volcanoes are built. Ongoing uplift and erosion of mountains over time bring deeply buried rocks to the surface. 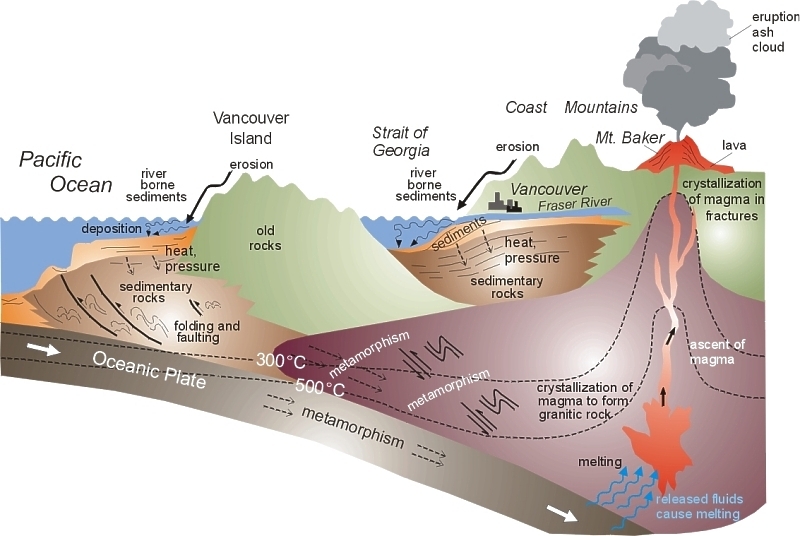 Cartoon cross-section of southwestern British Columbia illustrating the ongoing geologic processes that form rocks. Set in the Coast Mountains, the landscape of Whistler has been carved by rivers and glaciers from a foundation of ancient metamorphic rocks 100-200 million years old. Metamorphic rocks form deep in the earth at high temperature and pressure by recrystallization and deformation of older, pre-existing rock. Continued uplift and erosion of the mountains over geologic time has brought these deeply buried rocks to the surface. 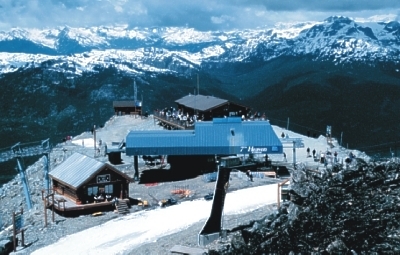 Blackcomb Mountain is a ridge of metamorphosed granitic rocks. This altered and deformed quartz-rich and feldspar-rich granitic rock is much harder than the mica-rich metamorphic rocks underlying Whistler valley. These rocks have better resisted glacier and river erosion and today form rugged Blackcomb Mountain. View of Coast Mountains from Blackcomb Mountain. 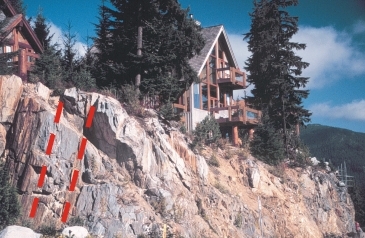 The town of Whistler is built on strongly layered mica-rich metamorphic rocks (schist). 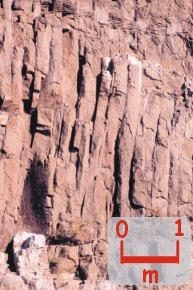 This cliff of schist fractures easily along its layering (foliation), producing an apron of flake-like fragments at the base of the cliff. Layering is due to the growth of aligned plate-like mica minerals during the metamorphism of volcanic rocks. Microscopic view of mica-rich schist. 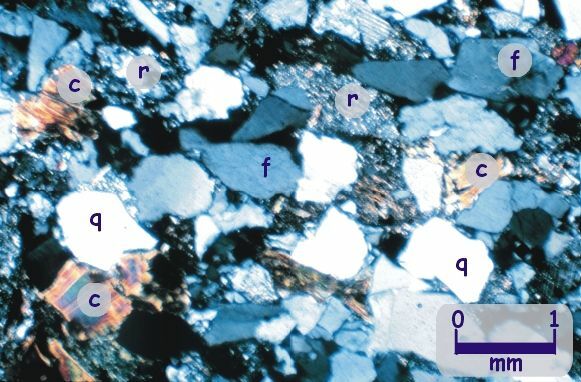 Aligned mineral grains of muscovite (white mica) and chlorite are weakly attached, allowing fractures to form along layering. Red dotted lines indicate layering orientation. The alpine meadows, glaciers, and striking blue lakes of Garibaldi Provincial Park are set in a volcanic landscape of lava flows and cinder cone volcanoes. 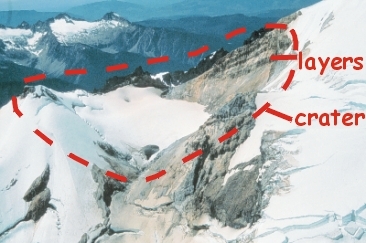 These landforms record the interaction of volcanic eruptions with glacial ice. The most recent volcanic activity occurred during the last Ice Age that ended 10,000 years ago. Mt. 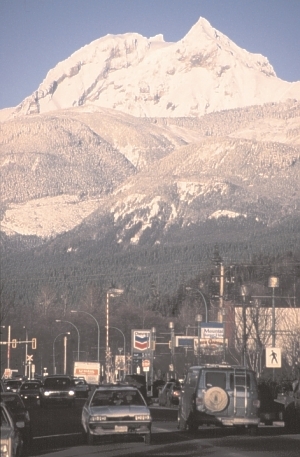 Garibaldi, an eroded volcano, towers two and a half kilometers above downtown Squamish. Mt. Garibaldi was built by violent volcanic eruptions 15 to 20 thousand years ago when the Squamish Valley was filled with a large glacier. 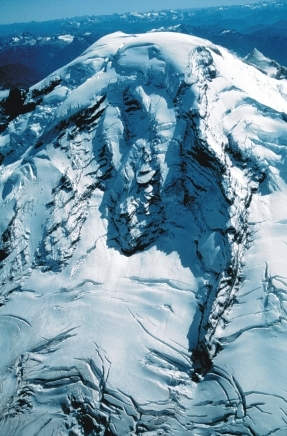 Volcanic debris that formed the western flank of the volcano spread across the surface of the glacier. 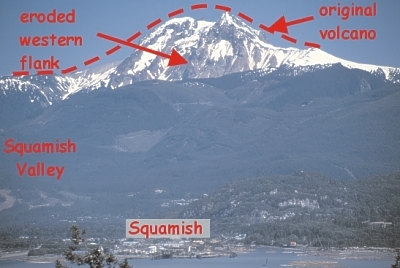 When the glacier later melted, the western side of the volcano collapsed into the Squamish Valley. The unusual flat top of the Table is due to the eruption of lava into a stagnant glacier that once covered the Garibaldi area. Erupted from below, the hot lava melted a hole in the base of the glacier forming a pool of lava surrounded by ice. Later when the glacier melted, the lava remained as a rock column with its flat top. Garibaldi Lake owes its origin to lava that flowed into an ancient river valley, damming stream waters and forming the lake. Glacier melt waters that flow into the lake are rich in finely ground rock particles (rock flour) that scatter sunlight and give the lake its striking milky blue colour. Black Tusk, a spire of volcanic rock over two hundred metres high, is interpreted as the remnant of a small volcano, perhaps the conduit for lava within a cinder-rich volcano. The loose cinder has eroded, leaving only the hard lava core. Layers of ancient volcanic blocks and ash have been exposed by the erosion of Mt. 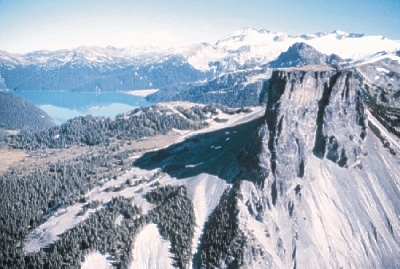 Garibaldi volcano in the upper Cheekye valley. The layers were deposited by hot avalanches of volcanic debris sweeping down the flanks of the volcano during explosive eruptions. Garibaldi lava is composed of pinkish matrix (m) and crystals of the minerals feldspar (f) and amphibole (a). The matrix consists of submicroscopic crystals formed by rapid cooling of lava to rock during eruption. 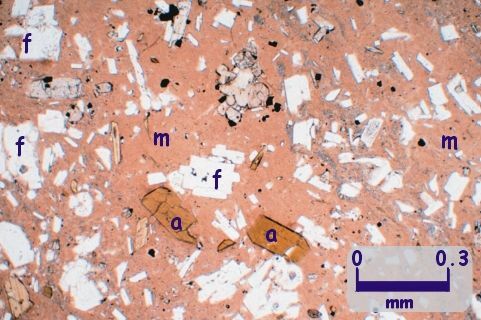 The large feldspar and amphibole crystals started forming deep in the Earth and were carried to surface with the rising magma. The great grey cliffs of Stawamus Chief Mountain, locally known as "the Chief", are famous landmarks in the Squamish area. 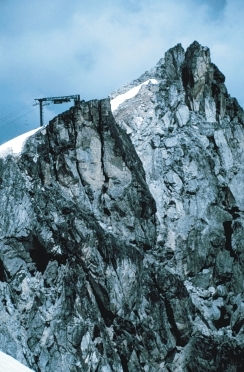 Rock climbers from around the world test their abilities on its vertical granite walls. Granitic rocks are ancient pools of melted rock that crystallized to rock kilometres below the surface. Tremendous uplift of the land coupled with continuous erosion over millions of years has brought these deeply buried rocks to the surface. 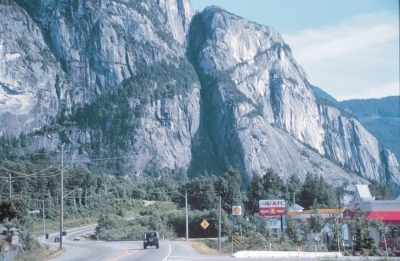 The Chief rises over 600 metres above Highway 99 at Squamish. Its great vertical faces result from glacial erosion along fractures in the granite. 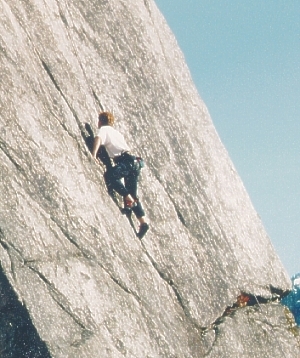 Most climbing routes on the Chief follow fractures in the granite. 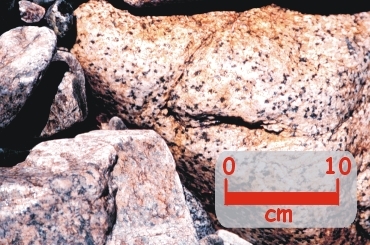 Granite is favoured by rock climbers for its strong, secure holds. The rough surface of granite, created by variable weathering of its coarse minerals, provides additional grip for climbers. 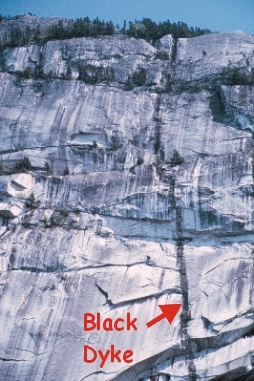 From Highway 99, the Black Dyke, several metres wide, is visible on the granite face. The Black Dyke formed by intrusion of melted rock (magma) along an ancient fracture. The dyke is basalt, a fine-grained rock that breaks easily, making it a poor climbing rock. Geologists estimate the granite and dyke to be 95 and 30 million years old respectively. The dyke may have been a conduit for magma rising to an overlying volcano, long since eroded away. Granite is composed of intergrown crystals of the minerals feldspar, quartz and amphibole that formed during the slow cooling of molten rock deep in the earth. This false-colour image uses polarized light that turns amphibole crystals into bright colours. 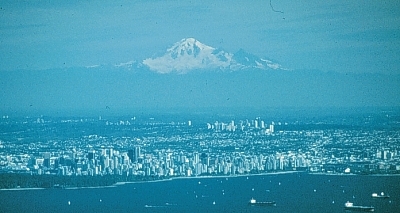 Vancouver's North Shore peaks are at the southern end of the great Coast Range, a mountainous ridge composed of granitic and lesser metamorphic rocks that extends 2000 km from Alaska to Vancouver. 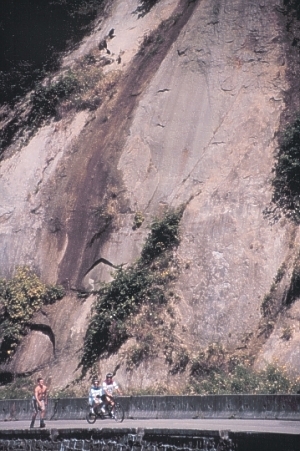 Granitic rocks are easy to see in cliffs along Highway 1 in West Vancouver, and along the access roads to Cypress Bowl and Mt. 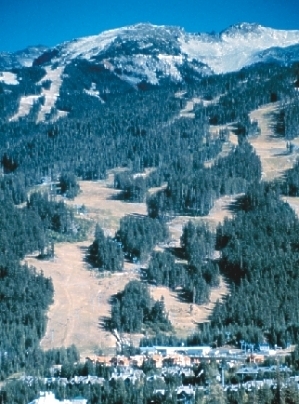 Seymour ski areas. 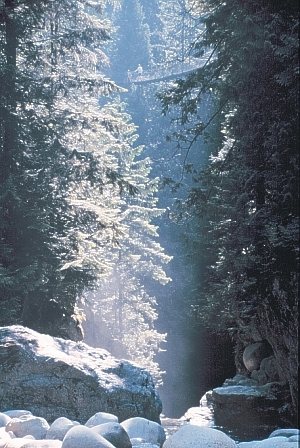 A view of Lynn Canyon and suspension bridge from the boulder bed of Lynn Creek. This canyon has been cut into granitic bedrock by the flow of Lynn Creek. 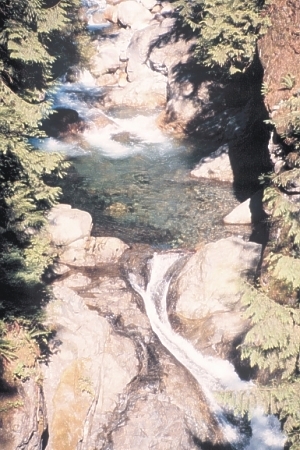 The Capilano River drains a mountain watershed. 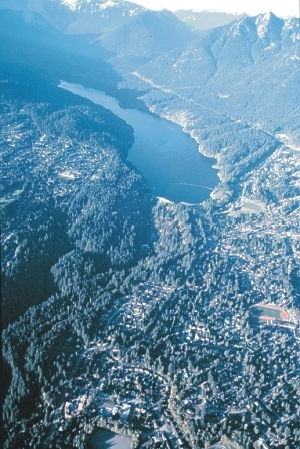 Capilano Lake, an important water supply for Vancouver, was formed by the flooding of the upper Capilano valley behind the Cleveland Dam. The dam was constructed at the upstream end of the canyon of the Capilano River. The canyon is cut into granitic rock. View of Lynn Creek from suspension bridge. Within its canyon, Lynn Creek has carved a series of pools and waterfalls into the granitic bedrock. Erosion occurs primarily during winter floods by the scouring action of tumbling rock debris. 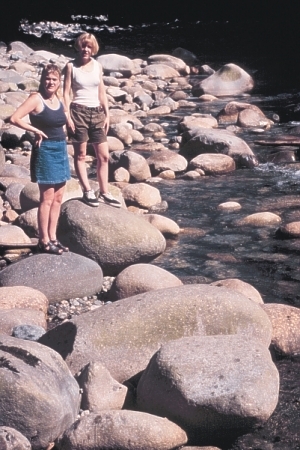 Abundant large boulders in Lynn Creek reflect the power of its raging floods. Finer sand and gravel is swept downstream by floodwaters, leaving behind only the boulders. The abundance of granitic boulders reflects the dominance of granitic bedrock underlying the drainage basin of Lynn Creek. Granitic rock is composed of an intergrowth of dark (due to high iron and manganese content) and light-coloured minerals giving it a 'salt and pepper' texture. Minerals include grey feldspar and quartz and black mica (biotite) and amphibole. Stanley Park's forested peninsula juts into Burrard Inlet. Winter storm waves from the Strait of Georgia have eroded the western side of the park exposing its bedrock foundation. 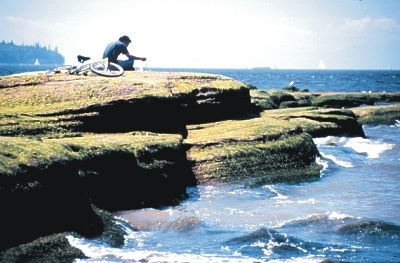 The popular seawall walk is a great place to observe the park's geology. Layered sandstone underlies much of the park while volcanic rock forms the prominent cliffs at Prospect Point and Siwash Rock. 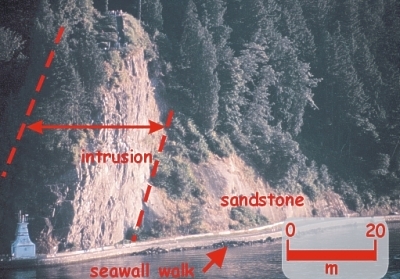 Prospect Point is a sheet-like intrusion (dyke) that formed when melted rock rose along a steep fracture in the sandstone. 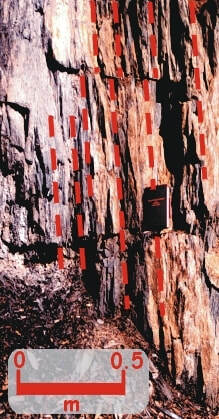 This 30 million year old volcanic intrusion is similar in age to the Black Dyke on the Stawamus Chief. Rugged volcanic cliffs at Prospect Point contrast with adjacent smooth sandstone slopes. The weak sandstone erodes easily compared to the erosion-resistant volcanic rock. Stanley Park peninsula likely owes its present size to this resistant northern tip of volcanic rock. Without it, storm waves might have long ago eroded away the soft sandstone. The cliffs of Prospect Point display fracture columns (columnar jointing) formed by contraction during rapid cooling of liquid rock to a solid. 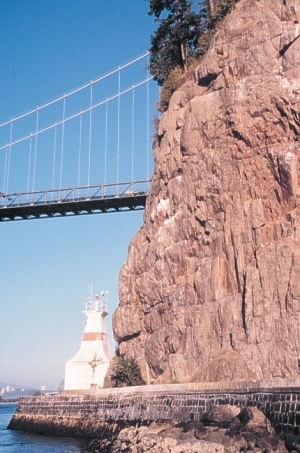 The cliffs of Prospect Point reflect the resistance to erosion of hard volcanic rock. The rock is a fine grained and dark-coloured basalt. 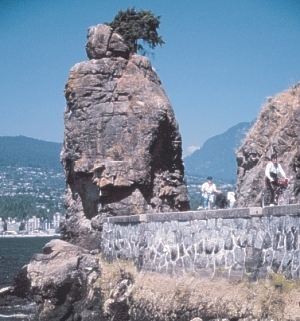 Siwash Rock is a famous rock pillar along the seawall route. It is a remnant of a rocky point of resistant volcanic rock that was breached by wave erosion. Green algae covers layered sandstone exposed in the intertidal zone at Ferguson Point. Wave erosion of layers with differing hardness has created the ribbed texture on the rock surface. Originally horizontal, these sandstone layers have been tilted to the south by the uplift of the North Shore mountains relative to the Fraser Valley. Sandstone exposed in cliffs along the seawall formed as layers of sand on the floor of an ancient river. Fossilized pollen in the sandstone indicates that the sand was deposited between 87 and 35 million years ago, a period of Earth history that saw the demise of the dinosaurs and the ascent of mammals. Though no dinosaur bones have been found in these rocks, small tree fragments preserved as coal are common. 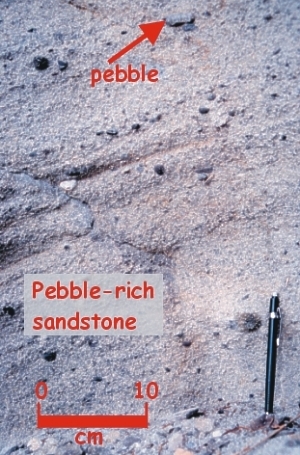 Turning this pebble-rich sand into rock involved deep burial in the Earth and deposition of mineral cement from circulating groundwaters. Deep burial was caused by continued deposition of several kilometers of overlying sediments within an ancient basin, similar to the modern Fraser Valley. Later uplift brought these sedimentary rocks back to the surface. Stanley Park sandstone is an aggregate of grains of the minerals quartz (q) and feldspar (f) and tiny rock fragments (r). The grains are loosely held together by mineral cement composed of calcite (c) and clay. 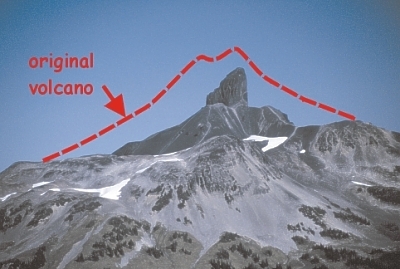 ​The cone-like profile of Mt. Baker is the dominant landmark on Vancouver's southern skyline. While surrounding lower mountains have formed by the slow uplift of the land, Mt. Baker has been built by repeated volcanic eruptions of lava and ash over the last 40,000 years. The cone-like shape of Mt. Baker indicates that the pace of volcanic construction has exceeded erosion by glaciers and streams. Mt. Baker last erupted during the 1800s. Mt. Baker has been constructed by outpourings of lava and volcanic ash. A record of these past eruptions lies within the volcanic layers exposed at Sherman Crater near the summit of Mt. Baker. Sherman Crater is the site of small eruptions during the 1800s and discharges of volcanic gas during the 1970s. Mt. Baker continues to steam today. Mt. Baker volcano rises 3300 m above Vancouver. Any future eruption of Mt. Baker represents a potential hazard to Vancouver and the Lower Mainland area. The summit of Mt. Baker is covered by glaciers. Future eruptions could result in rapid melting, mobilizing loose volcanic material into deadly mudflows. These mudflows descend stream valleys at high speed and can cause devastation for tens of kilometers downstream. This bubble-rich lava is composed of rectangular crystals of the mineral feldspar, and casts of gas bubbles. 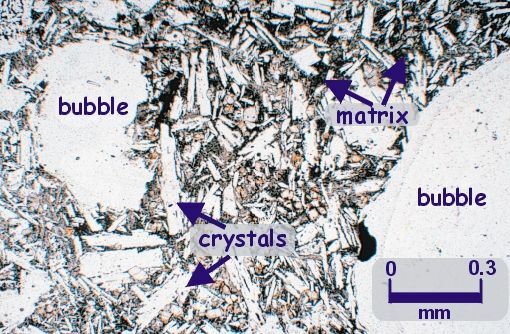 The matrix contains submicroscopic crystals whose growth was curtailed by the rapid cooling of the lava during eruption. 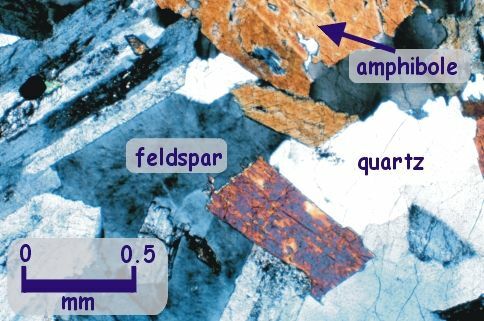 The feldspar crystals grew in slow cooling rock melts (magma) deep in the Earth and were carried to surface in the rising magma. Rapid cooling to rock trapped gas that was bubbling out of the lava, preserving a sponge-like texture. Helpful reviews of draft versions were provided by Cathie Hickson, Tom Harding, Andrew Humphries, and Wendy Lewis.